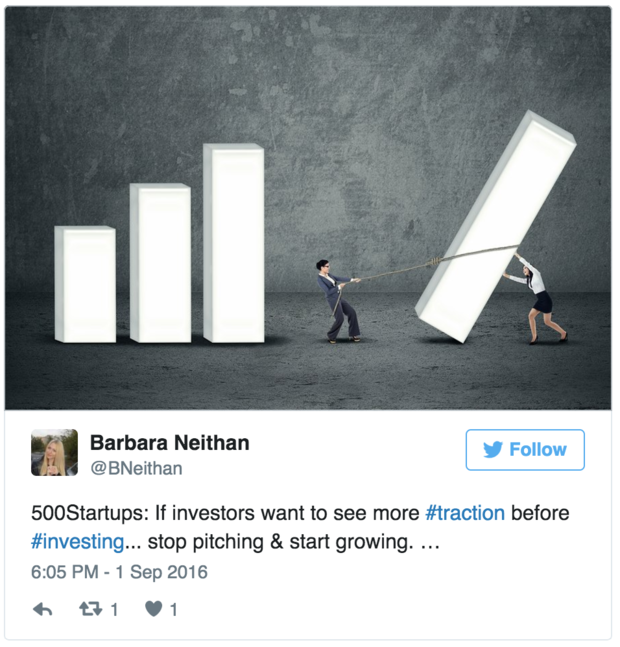 Today’s investors want to see traction before they open their checkbooks. Entrepreneurs looking to raise capital are learning a universal lesson as of late: today's investors want to see traction before they open their checkbooks. That is, they want to see that a business is already making money or generating an audience before they jump on board with an idea. Think about it from the investor's perspective. There are so many great "ideas" out there, but the reality is, the execution and the team behind an idea is what actually drives business. And with increased access to data and social platforms that gauge audience interest, investors are able to make more informed decisions than ever. That's not to say that it's next to impossible to gain investor interest if you're just starting out — but you do have to be a great marketer. Here are a few pointers. You've probably heard Albert Einstein's old phrase "If you can't explain it simply, then you don't understand it well enough." Well, the same applies to giving a great elevator pitch to investors. When you're talking about your business, it can be easy to get too wordy or overcomplicate your description (because you think it sounds cooler that way). But actually, explaining your product simply and elegantly has the most impact. Remember, attention spans are short, so you have to grab investors' attention by speaking in a language they're comfortable with. You can have a great product and a solid strategy — but if you don't know how to properly execute your go-to-market plan, your business could fall apart before it ever gets off the ground. Investors know this firsthand. "Savvy investors are looking for a combination of a great innovation combined with an ability to execute," says John Bara, president and CMO of Mintigo — a company that recently received a $15 million Series D investment from Sequoia Capital Israel. "One without the other is an incomplete and therefore riskier package. Be sure to project both." As you're pitching your idea and strategy, make sure that you demonstrate how you will execute your plan. You want your investors to see that your strategy has been defined down to the last detail, so that they can be fully confident in your ability to sell your idea to the masses. This past summer, Uber made headlines for reportedly losing $1.27 billion in the first six months of 2016. Sadly, countless other startups are also burning through their capital at rapid rates, leaving investors with little hope of ever being paid back. Startups in any industry can learn from this. While it's easy to get ahead of ourselves by hiring or buying with future growth in mind, it's best to be cautious. Certainly don't skimp on quality, but don't be excessive. Take a good long look at your operating budget. Are you overspending because you have a false feeling of security? What can you cut? How can you use your creativity to do better work while keeping costs low? Investors will be asking these same questions, and you'll need to have a good answer! Remember, investors don't simply invest in ideas — they mostly invest in people with passion. As angel investor and CEO of leading fintech company YapStone, Tom Villante recently noted, "Inspiring people who exude passion and positivity send a deeper message to investors." If you are not passionate about what you're doing, don't expect potential investors to be thrilled to work with you. Passion is infectious — if you have it, chances are you will easily generate excitement from the people you are pitching to. It's also critical that you only pitch products or services that you understand deeply, particularly as a first-time entrepreneur. As angel investor and creator of Thrive: Make Money Matter Cole Hatter said about entrepreneurs whose businesses he considers investing in: "I want to see industry knowledge. I want to know that she knows it like the back of her hand. It can't be just a good idea, with money being the only motivator. Or, if it's the case of a pitch from a serial entrepreneur, I want to see their success track record from previous ventures." In closing, don't get discouraged in your quest to land an investment. Like every other good marketing initiative, successfully pitching to investors is part science, part art. Embrace the trial-and-error aspect of this process and go to as many pitch meetings as you can. This will give you the best chance possible of finding the right capitalist. And as a byproduct, you will fine-tune your pitching skills. And if you take nothing else away from this article, always remember to approach your investment with a marketing head and a passionate heart.